What these researchers did is took two groups of ostensibly healthy young adults (in their 20s) and older adults (in their 70s), and subjected them to a word-pair matching memory task where English words and nonsense words were associated and subject to a subsequent forced-choice recognition memory test (they did administer a number of other neuropsychological tests, but the critical one was the word-pair matching task). They selected the word-pair task because it was found in previous research to be sensitive to the effects of sleep in subjects performing the task. Subjects were assessed immediately after the task, and then after a typical nights sleep for them (if you call typical when you’re wired up in a sleep lab), they were tested again – but the testing the next morning was done with subjects’ brains being monitored via fMRI. In both methods for scoring sleep, there was little real change in the objective criteria for identifying so-called Rapid Eye Movement, or REM sleep. N1 and N2 (formerly 1 and 2) were the same across both staging methods (representing N1 / 1 being essentially just drowsing, and N2 / 2 being so-called “alpha wave” sleep – where conscious awareness of the environment disappears). Slow-wave sleep went from being measured across multiple sleep stages (3 & 4) using the R&K criteria and now is now measured in a single sleep stage (N3). Below is something called a hypnogram, where sleep can be visually represented across the various sleep stages – typically looks like this (peaks on this graph represent waking periods, with lower points representing increasingly deep sleep). The above hypnogram is a fairly typical looking representation of a young adult’s sleep pattern across an entire night. As is typical, there is more slow-wave sleep during the first ½ of the night and more REM sleep during the second half. 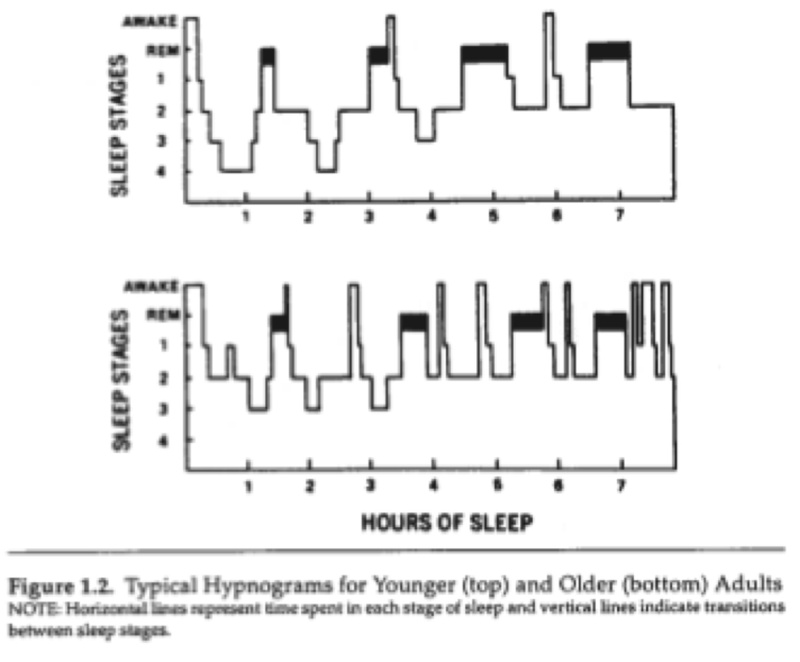 Now let’s look at a hypnogram depicting the same, typical young adults’ sleep with that of a typical older adult (from Lichstein & Morin, 2000; Treatment of Late-Life Insomnia – a great book). (Note that the hypnograms here are scored using the older R&K criteria). Note a difference? The term used by the sleep folks is that older adults, even ostensibly healthy ones, tend to show evidence of a “fractured sleep architecture,” characterized by more intrasleep arousals (those are the very highest points represented on the hypnogram), a generally shallower “sleep depth,” and significantly less time spent in NREM sleep (e.g., non-REM sleep). Lack of sleep depth and reductions in NREM sleep tend translate into lack of so-called slow-wave sleep. Slow-wave sleep (SWS), is referred to as such due to the distinctive pattern of 75microvolt (0.5-2 Hz) waves observable on electroencephalogram (EEG) leads during a polysomnogram, and consist of stages 3 and 4 of the R&K criteria (now just stage N3). SWS is not dreaming sleep and typically when subjects are awoken from SWS they do not report dream activity (unlike REM sleep). It’s considered the most physically restorative sleep period, notable by the fact that production of human growth hormone (HGH) peaks during this time of night. Also, when SWS suffers in otherwise healthy young adults (as is the case in patients suffering from narcolepsy), the result is subjective reports of being physically exhausted, despite sleeping several hours a night, such as this person. Back when I was a lowly predoctoral intern in psychology at UMDNJ in New Jersey, I did a rotation at the hospital’s sleep lab where we saw a number of patients and offered treatments. One of the “rules of thumb” I learned when I was first learning sleep medicine is that SWS is for resting the body, and REM sleep is for resting the mind. Of course, sleep is an inordinately complex biological process and while it seems likely that REM sleep plays a role in consolidation of certain types of memories, it now seems clear that SWS plays a role in consolidation of memory, particularly declarative memory, as well. So, back to Mander, Rao, and Lu et al. (2013; the Berkeley study referenced at the beginning of this post). What these researchers found is that SWS deficits observed in older adults were reliably related to performance deficits on the word pair matching task, and that this SWS deficit observed in older adults, moreover, was related to degeneration of a part of the brain called the medial prefrontal cortex (mPFC, part of the frontal lobes of the brain), and finally, was also related to overactivation of the hippocampus the next day. The idea, of course, is SWS is the mechanism by which memories stored in the hippocampus (sort of a neurobiological memory buffer) are consolidated and shunted to the cerebral cortex for long-term storage, via the mPFC. If the mPFC is malfunctioning, the memories stay stranded in the hippocampal ‘buffer’ until they are overwritten. Which, of course, then provides us with a fascinating account of how those “senior moments” take place, or worse, how dementia begins to show itself in older adults. The question is, how is this information of practical use? Interestingly, there are a number of ways to boost SWS. Exercise, hot baths, carbo-loading are some easy, drug-free methods. One of the active ingredients in cannabis, THC, is known to increase the duration of SWS. 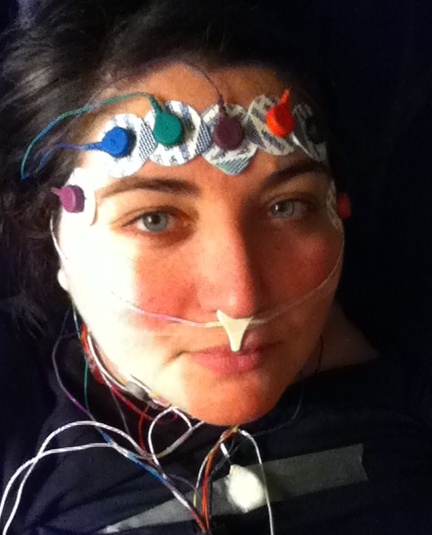 Transcranial stimulation (also known as EMG) is another method. Hot baths, exercise, and eating sweet treats sounds nice, but may not do the job on their own. Use of cannabis to boost SWS, while it might be effective and with few side effects (aside from perhaps an increased preference for the aforementioned sweet treats) isn’t a particularly practical treatment given its current legal status. EMG is interesting but even more impractical given the expensive and unwieldy equipment required. Another treatment option for boosting SWS is a prescription medication called Zyrem, also known as sodium oxybate. Zyrem is basically a chemical analogue of gamma-hydroxy-butyrate, also known as GHB. GHB, of course, is a neurochemical that humans produce endogenously (in our brains) and is thought to be related to the maintenance of the human sleep cycle, particularly as it relates to SWS. Even there, however, the practicality issue makes use of GHB and GHB analogues difficult – GHB is also an illegal drug, like cannabis, and Zyrem is a drug that is more tightly controlled than many narcotic pain medications, and is only approved for use in narcolepsy. This is unfortunate. Barring the invention of a cheap and portable version of an EMG machine for use in older adults beginning to show signs of memory problems (or even showing signs of frank dementia), direct methods for stimulation of SWS production in older adults is difficult given the practical (legal) limitations on use of agents like cannabis or GHB. Of course, we should back up for a moment. It’s certainly possible that boosting SWS in older adults may be a successful treatment for memory problems – but it may not be. Recall that in the Berkeley study (Mander et al. ), the reduction in SWS was observed to be related to degeneration of the mPFC (part of the frontal lobes of the brain). Its possible (although it seems unlikely) that boosting SWS may not reverse memory problems in older adults because, after all, it’s unclear how boosting SWS would actually reverse the brain damage we know now is associated with dementia. However, this is interesting information and hopefully there will be research taking place. This entry was tagged dementia, older adults, REM sleep, sleep. Bookmark the permalink.